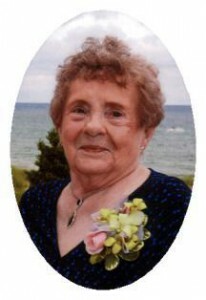 Marguerite C. “Marge” Ziebell, 84, of the Maple Crest Apartments, West Sunset Road, Port Washington died peacefully Saturday, February 4, 2012 at her home. She was born on April 21, 1927, daughter of John and Catherine Siegrist Slupinski in Milwaukee, WI. On November 6, 1950, she married Harry A. Ziebell of Milwaukee at St. Robert’s Catholic Church in Shorewood. He preceded her in death on April 16, 1998. She graduated from Marquette University with a degree in Elementary Education. For over twenty years she taught first grade at Mother of Perpetual Help Parish School on Villard Avenue in Milwaukee. In 1968 they moved to the town of Grafton. She was a member of St. Francis Borgia Parish in Cedarburg where she was the CCD director for over 20 years. She moved to Port Washington in 2006. She was an avid sports fan, enjoyed gardening in the outdoors and cross-stitching. She is survived by four sons, Steve (Bethany) Ziebell of Port Washington, Greg (Connie) Ziebell of Fillmore, Mike (Renee) Ziebell of Spring Valley, IL and Richard Ziebell of Thiensville, ten grandchildren Chris (Caitlin), Dan, Adam, Katie, Arianna, Brendan, Ryan, Jacob and Nick Ziebell and Rachel (John) Ralston, great-granddaughter Teagan Ralston, her sister Manette (Jim) Dohogne of Wickenburg, AZ, other relatives and many friends. She is preceded by her husband Harry and her sister Clara Wisniewski. The Reverend Mike Barrett will celebrate Mass of Christian Burial 6 pm Friday, February 10, 2012 at St. Joseph Catholic Church, 1619 Washington Street, Grafton. Visitation 4-6 pm Friday AT CHURCH. Interment St. Francis Borgia Catholic Cemetery in Mequon. Memorials to the Colon Cancer Society of America or the charity of choice appreciated.